Of all the reasons Denverites had to get excited about the two protected bike lanes their city opened Thursday, the most underrated was a feat that you maybe will only fully appreciate if you’ve ever worked in government. They’ve created the first true connections in a low-stress biking network with which the city intends to join its excellent trail system with its major downtown destinations. Their ceremony capped a remarkable public process that began with a local business advocacy group creating a one-day demo on Arapahoe and then leading a successful online crowdfunding campaign to pay for the design work that would make it permanent. 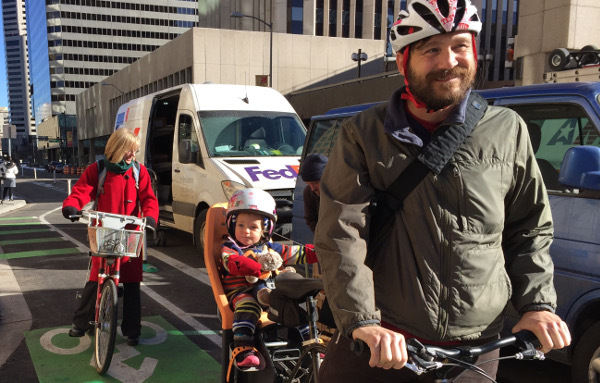 Maybe best of all, Denver Mayor Michael Hancock on Thursday promised three more protected bike lanes in 2016. Central Denver’s current low-stress biking network. Lawrence and Arapahoe are the southwest-northeast couplet. But hiding among all that was this remarkable fact: Denver brought both of these one-mile street projects from preliminary planning to completion in less than one year. Martha Roskowski, the vice president for local innovation at PeopleForBikes, attended Thursday’s event and talked to city staff about a process that moved, by bureaucratic standards, at warp speed. Denver’s commitment to speed is impressive, and it’s also part of a national trend. Last year, Pittsburgh and Seattle both added shorter protected bike lanes through their central business districts in a matter of months. Cities’ embrace of quick-build projects is partially a reflection of the fact that unlike freeways, bike lanes can be tweaked. This means that outreach and design don’t have to end with the ribbon-cutting. But on a deeper level, cities are working quickly on projects like these because they’ve arrived at a consensus that whatever might happen to their streets, some sort of change is necessary. When the status quo stops being an option, decisions start getting much easier to make. So we’ll close with the words of three local leaders who explained wonderfully at Thursday’s event why change on Denver’s streets is necessary. People who are sedentary — and this is a sobering statistic — have almost twice the risk of having heart disease or stroke compared to those who are active. That’s scary. But it’s a statistic we actually can change simply by investing in healthier transportation options. The logic here is really, really simple: the more you move, the healthier you are. If we’re going to be a city of the future, you must be a multimodal city. You must have choices. … We’re going to keep on doing this. We’re going to be bullish on this. We’re going to probably upset some folks because they don’t see the overall vision. But we’re doing this around the world. And this is the city that we’re becoming. It’s not just about bikes. It’s about buses. It’s about trains. We are trying to cut down our mode share so we can have an incredible city. That’s where we were inspired to believe that we could do this. And I guarantee you, we can do this. It’s not just about bikes. It’s about our future workforce. It’s about the economic vitality of our city and our central city. It’s about our brand. Though it’s a national leader in physical activity, Denver hasn’t been a national leader in bike infrastructure until recently. But if Denver can move its next projects with anything close to the speed it’s moved these, it’ll start catching up fast.